Sensational mobile device, InnJoo 3 has finally been officially launched into the Nigeria’s market, reports ITRealms. 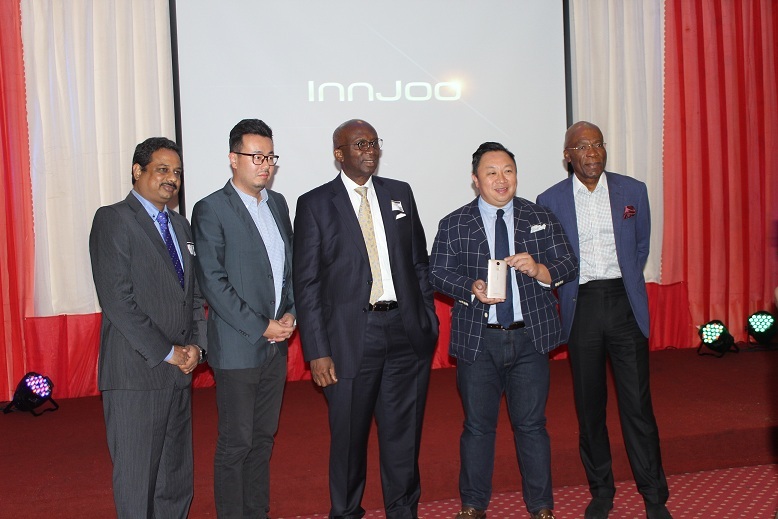 The President of InnJoo, Mr. Jack Lee in his opening remarks at the ceremony held at Lagos Sheraton on August 1, 2016, declared that InnJoo is in the Nigeria market for a long stay. “InnJoo is in Nigeria to stay, “ he declared, listing the features of smartphone which he said would developed , especially for the Max 3 with the Nigerian mobile phone users in mind. He stressed optimism that Nigerian mobile phone users must have a choice a better smartphone, it would be InnJoo Max 3 which was an advancement from InnJoo 2. Also speaking, the special guest of the occasion, and former Executive Vice Chairman of the Nigerian Communications Commission (NCC), Dr. Ernest Ndukwe, noted that any product with the kind of features of InnJoo Max 3, must be very applying to Nigerians. “Especially if it has a big screen because people now watch films and foot balls among others via their mobile devices,” he said. Expressing support for such a project, Ndukwe was optimistic that InnJoo Max 3 will have a resounding market acceptability in Nigeria. “As a good phone with good price, it will have market edge,” Ndukwe said and recommended InnJoo Max 3 to Nigerians. The chairman of Technology Distribution West Africa, Dr. Leo-Stan Ekeh assured that with TD involve in bring InnJoo into the Nigeria market and its partners across West Africa, InnJoo products, and mostly the Max 3 will be available every part of the subregion. Ekeh also said his firm researched InnJoo before TD partnered with the brand. In his production presentation, the Country Manager, InnJoo Mobile, Rakesh Rocque, said InnJoo Max 3 is a high-specifications smartphone with an epic six-inch High Definition (HD) screen with fingerprint technology, offering more value to millions of consumers. He also told ITRealms that InnJoo Max 3 was built around an all-metal body design and the first time applied 2.5D diamond-cut glass, is a sleek and premium-looking device that would go a long way in meeting the needs and aspirations of millions of Nigerians in search of a high-powered mobile device at a cost that makes sense in line with current economic realities. Aside offering unparalleled bigger screen to work with, InnJoo Max 3 comes fully equipped with a 4000mAh long-life battery designed in line with consideration of the power situation in the country, availing users over 2 day-long normal usage and 19 hours phone call time with a single charge. In addition, he said, with its rapid response quad core processor, the Max 3 offers the user 0.35 seconds lightning fast unlock speed, along with the guarantee of quicker upload and download of multimedia contents. Just as selfie lovers could make it a very useful tool with its high-powered dual cameras: 13MP at the back and 8MP in front which offers auto-focus, multiple modes and anti-shake properties, delivering best in class picture quality. 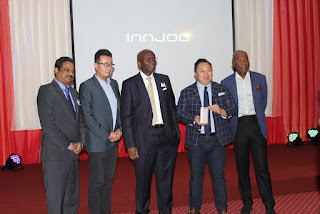 Pic: L-R: Country Manager, InnJoo Mobile, Rakesh Rocque; Co-founder, TecSync Technology Co. Ltd., makers of InnJoo Mobile, Tim Chen; Special Guest of Honour and former CEO, Nigerian Communications Commission (NCC), Dr. Ernest Ndukwe; President, TecSync Technology, Jack Lee and Chairman on the occasion, Leo Stan Ekeh at the official launch of the InnJoo Max 3 at Sheraton Hotel, Ikeja... on Monday August 1st 2016.